River rats we were called, no better than gypsies they would shout. I grew with a chip on my shoulder and a frown on my brow. I came to Venice; fell for a gondolier or two. Nobody spat on my shoe, my art degree held weight … my purse too. with Mum and Dad. Me, throwing my fists, defying the world. A tear Stained face wrapped in muscled arms smelling of old spice and tobacco. I am now a river rat wrapped in Ermine. The motorhome thumped up the lane rocking and jerking over the hardened earth that shook our jaws. As the last curve was negotiated the campsite spread before us. Flags flapped against the mackerel sky. Swags and flags swirly Twizzlers rattled and spun as did novelty air filled sperm. Campers tugged miniature trailers, all polished looking their best. Unicorns flapped, bunting tangled and faces lit up and grinned. We strolled around, caught a knowing look or two. Smiles and nods tossed our way, a greeting of strangers linked by destination and sounds. Kids and pups were happily pulled along in trailers packed with stuff for the day. A squeal from the stage shocked our ears as the thump thump of a base backed the ‘ one two, one two’, called over the mike. Flowers and glitter in hair and on faces caught the light as hula hoop girls spun in tiny sequined shorts. Toned bodies of aerial dancers arced and rolled precariously. Dancing under steel frames, suspended on strands of purple ribbon. Goods displayed on trestle tables and rails spewed from the mouths of canvas shops. Old tut from dusty lofts became prized merchandise once more. Hats, bags, wigs and wings, wands and make believe; all at a price. Clothes from eras past with stories sewn into the weave. Love’s lost and consummated in the seams of an old mini skirt and psychedelic clothes. Cheese-cloth shirts and bell-bottom jeans, wait in hope as rushing winds flap at hems, like silent adverts vying for attention. Giant robotic installations jerked and flashed to the beat. Bubbles shot across the giggling crowds and flames intermittently roared from an arm that shot skyward. Ooh’s and ahh’s join the music at each glow of the flame. A folly watches from her view point snuggled in the trees. The festival and its entourage playing at her feet. Not so far from the days of Jousts and Jesters that took place in times gone by. Girls danced with a freedom I long since lost. Dreadlocks and rainbow dyed hair mingled, with the French plaited girlies. Shaved heads bump and grind with hipster bearded men. Some smoke weed or swig artisan gin together. One place, one time, a shared experience. The music built up and bodies moved in unity, the youth and the aged together. All made new connections and memories alike. Rain splashed bodies ran for shelter and kids tried to catch drops on their tongues. Even the weather became a game. Sticky and tired we turn in and watch the sun setting over Suffolk. Until sizzling bacon awakened our taste buds then the enthusiasm bubbled up, begging us to do it once more, at a Suffolk festival. 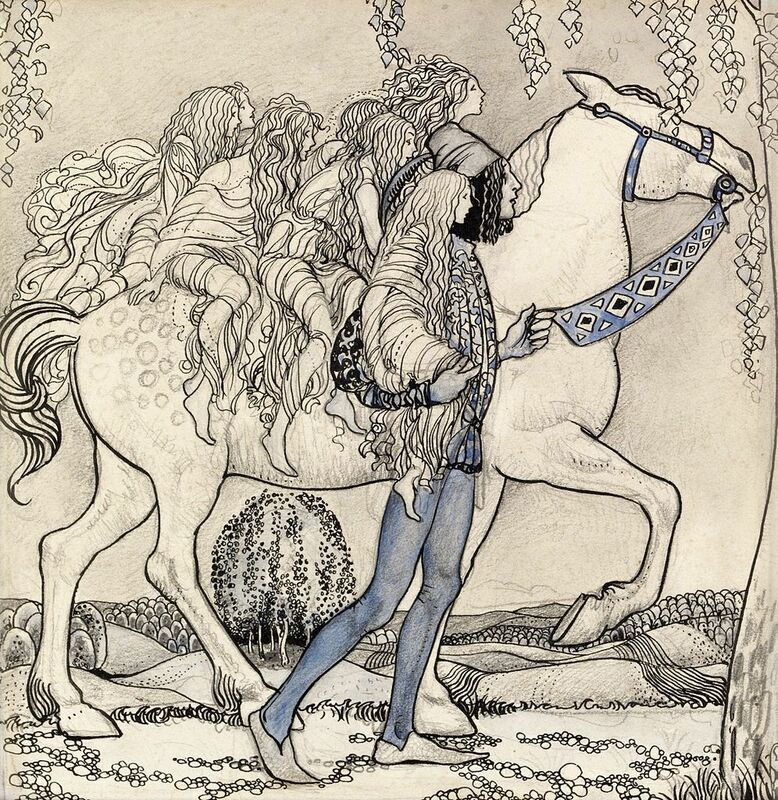 Jane Dougherty challenges writers and poets amongst us with another visual prompt press 🔜 here 🔙 to join in The artist to thank for the loan of this picture is John Bauer. Lady Godiva, wife of Leofric, Earl of Mercia is a well-known tale across the land, but the lesser known second cousin once thrice removed of that noble Lady was Stanley Kingsbury, after hearing of the famous ride it gave the down at heel blaggard an idea. Stanley had himself seven daughters and one beautiful dapple grey stallion. Stanley’s daughters were begotten via three sisters none of which he had been betrothed… early that year they gifted him his daughters and fled to some say sunnier climes in the hope of finding husbands while unchattled by the presence of their loose morals. They together persuaded Stanley that once settled they would call for the girls as ladies maids and staff, that way they would live openly under the wing of their birthmothers but hidden from the smear of wrongdoing. Meanwhile, Stanley poor as a church mouse decided to replicate Godiva’s ride with all his daughters on the one horse. He paraded the girls in hope of suitors, through the streets far and wide they rode. Alas, each time the townsfolk were alerted to the coming of an ungodly scoundrel and ordered to “keep within Doors and from their Windows, on pain of Death” Subsequently the girls were handed over to their grandmother and Stanley could be seen from the four corners of Mercia mounted on Pikes. Any likeness to any living or dead person or persons is entirely coincidental. A Place that stirred my Very soul. The Lotus temple is my favorite building, the one above all others that has come to be the beginning of a new me; a second chance. Whilst working in India I had the chance to visit this amazing marble clad structure. My visit was the most ethereal moving experience I have encountered. I was doing a whistle stop, sightseeing, must do on your last day bus tour – not the way I like to do things, but people had presented me with the ticket, and they were so proud of their country and my gift there could only be graciousness with my acceptance. I may at another time elaborate on this extrordinary day, but for the moment I will introduce the building in all its spiritual beauty. This picture for which i am very greatful is from pixaby link below. 2. Bahai law emphasizes the universality of all religions. It states that House of Worship is a gathering place for people of all religions. 3. The law further states that only the holy scriptures of Bahai faith and other religions can be read or chanted inside in any language. 4. The readings and prayers can be set to music by choirs as per the law specified by Bahai religion. 5. No musical instruments can be played inside the house of God according to the followers of Bahai religion. 6. Furthermore, no sermons can be delivered. Hence, there is no place for practice of ritualistic ceremonies within this religious community. 7. 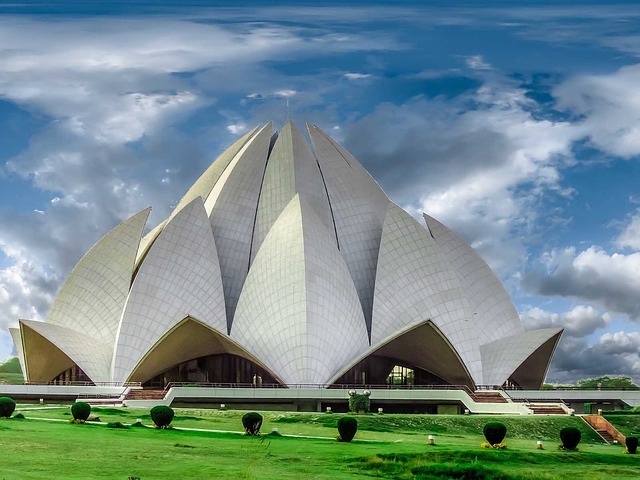 Like other Bahai Houses of Worship, the Lotus Temple shares certain architectural elements. Some of these are specified in the Bahai scripture. 8. Abhui-Baha is the son of the founder of this religion. He had stipulated that the essential architectural character of a House of Worship should have a nine-sided shape. 9. All the Houses of Worship built by the Bahai community have dome in the central structure. However, the Lotus Temple does not have this characteristic architectural element. 10. There is no place for pictures, photos, statues or images in Bahai religion. The bus pulled up, it was the middle of monsoon season and every surface glistened from the rains of the morning. There were racks to leave your shoes and lockers to put your belongings,camera’s, phones, water, food. I had a purse on a long leather strap across my body under my dupatta, which is a shawl to cover my shoulders or head; necessary in some of the places I had to visit that day. My purse carried my medication some money and my Id, like the other visitors I had, no shoes,no bags, no camera, just space and myself. Some of the people were guided outside around the perimeter, and a few inside, so that the space was uncompramised. At first the vastness is overwhelming the silence was unexplainable. I lay as others did on a marble pew or structure, where you looked into the centre of the lotus flower high above me. My breath and occasional rustling as people settled were the only sounds. I lay for maybe fifteen minutes time dissipated, it was as if I was waiting for something; then it came. A small bird fluttered around the beams and rested as high as he could get, he threw back his head and sang; the notes reverberated off every surface magnifying each note. I realised I’d been holding my breath, as i gasped he disappeared just as quickly as he appeared. My moment will stay forever 2009 in many ways marked a turning point a new life for me, with this experience at the top. I hope you liked my memory and would love to know if a place holds something special for you all comments are welcomed and answered promptly.